And I try to use this page to check, I found that some country can't link the site, too. I think there is some problem in the server. My NIS 2010 sometimes also take long time to update, and Norton Community Watch can't submit files in some IP, I think it's a reason. 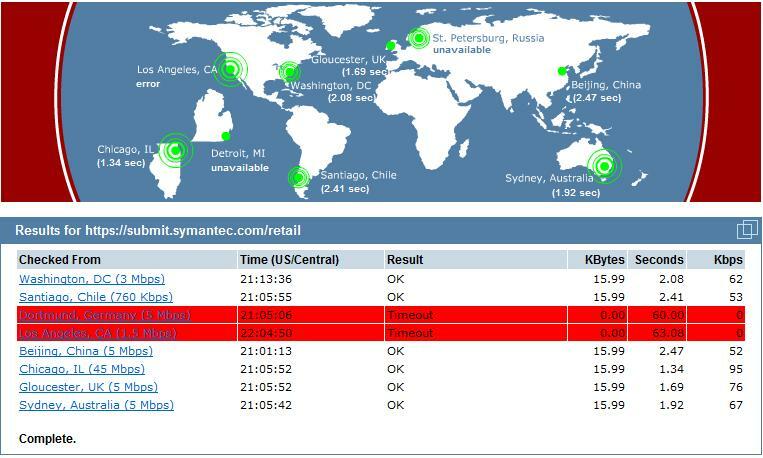 Re: Some country IP can't link to Symantec submit page. If I use this IP, it's ok. But if I use other IP, it can't link. So I think if some IP address link to the submit page, it will become TimeOut.